Animals are amazingly adapted to live in different habitats. Fish use fins and tails to move, birds fly, and cats pounce and bound on four feet. 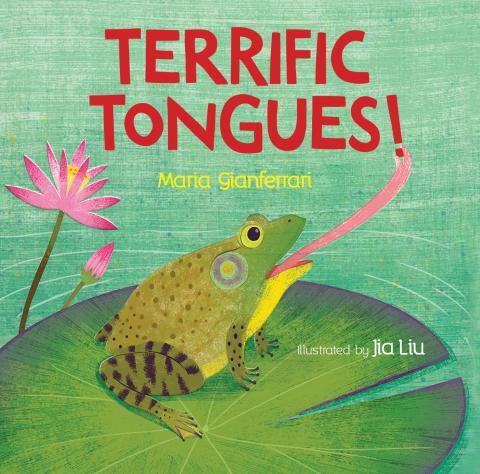 Here’s a book that takes a closer look at animal adaptations. You use your tongue for a lot of things: licking ice cream cones, tasting food, and helping shape the words you speak. But can you use your tongue like a straw? Moths do. They have long, tubelike tongues that roll up like garden hoses! Moths use their tongues to reach down into tubular flowers to sip nectar – I’ve watched them do this in my garden! Some animals have tongues like swords, or windshield wipers. What I like about this book: On one page, Marie sets up a situation. For example, “If you had a tongue like a washcloth, you might be a….” Turn the page and you discover what sort of creature has such a strange and useful tongue. I’m pretty sure our tongues seem strange to moths. Or frogs. I love the bright, playful illustrations. I also like the back matter: one spread provides lists of things tongues do, and another tells more information about each of the animal tongues featured in the book, from forked snake tongues to radulas. Head over to Archimedes Notebook where you’ll find a couple more books about animal adaptations.